From an early age, in the studio of his sculptor father, Thomas Bertrand (born in 1963) was able to observe the metamorphosis of matter. But it was the music that constantly filled the studio that exerted an irresistible attraction on him. Through learning to play the cello he became aware of a fascinating synthesis of matter, form, and sound. 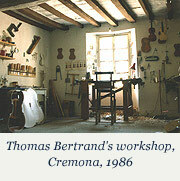 After a brief period at university, he immersed himself in the spirit, styles, and techniques of classic Italian violin making in Cremona. After graduating from that city’s International School of Violin Making (IPIALL) in 1986, he went on to further training in Germany, where he learned about the restoration of the masterpieces of the past. In 1991 he opened his workshop in Brussels, where he both makes instruments and carries out sound optimisation. The instrument is the link between the performer, the music, and the audience. A “transformer” of movement into sound, it shows many analogies with the human body, in its structure and in its operation (joints, points of balance, interrelationships, etc.). It is all about dynamic balance and perpetual readjustment, between mobility and rigidity, resonance and silence, in response to the musician’s prompting. Nothing is fixed. As in music. As in life. Thomas Bertrand constructs a unique means of expression for musicians. He places at their disposal a palette of timbres, of sound material. He optimises the interactions between the instrument and the performer, ensuring that every detail makes for the greatest possible ease of playing: the thickness and profile of the neck, the shape of the fingerboard, the curve of the bridge, the choice of strings, adjustments adapted to the style of play, the size of the instrument in relation to the musician’s build (especially for violas and cellos), etc. Thomas Bertrand draws his inspiration from the masterpieces of the Cremonese and Venetian masters of the classical period. Analysis of the principles on which they work, combined with mastering anew the design methods and drawing processes current at the time, has allowed him to explore new possibilities for the evolution and adaptation of instruments to meet the requirements of today’s musical life. Every year, his quest for the best maple and spruce takes him to Italy, Germany, France, and elsewhere, where he selects his wood with the greatest care. Growth, density, responsiveness, cut, maille, flame, etc. : his selection criteria become ever more numerous and precise. Several years of drying, moreover, are necessary before the wood can be worked. Made to extremely high standards of quality, Thomas Bertrand’s instruments meet the requirements of the most demanding musicians. 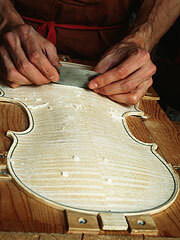 He has participated with success in the world’s most important violin making competitions. 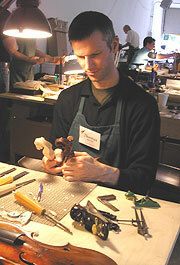 Thomas Bertrand is a member of a number of violin makers’ associations, including ALADFI (France), Klanggestalten (Germany) and the VSA (United States). He takes part frequently in workshops, seminars, colloquia, and exhibitions in France, Germany, Italy, and the United States. In this way he keeps abreast of the latest scientific, technical, and historical research and constantly renews his inspiration. He is a regular attender at concert halls and festivals and, as a member of the audience, also attends master classes.